UK’s biggest outdoor store chain, GO Outdoors, has released a new advert, encouraging people to stop scrolling and start strolling. 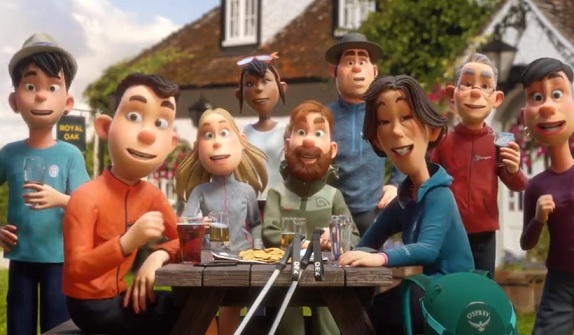 The animated spot features several people of different ages and backgrounds spending time outdoor – some of them camping, others fishing, riding bikes through a forest, enjoying a drink and snacks around the table, at a guesthouse. At the end of the advert, viewers are informed that they can get extra 15% off everything until April 23rd. Onscreen lines also specify that savings are off Discount Card price and a Discount Card is £5. Serving as soundtrack is a song performed by a female voice, singing the lyrics “Why don’t you, just switch off your phones and tech and go out and do something less boring instead? Why don’t you go, go, go?”. The chain also urges people to find out how getting outdoors this summer could help them win £100 in GO Outdoors vouchers by visiting the GO Outdoors website. It also encourages people to take on the GO Outdoors challenge and aim to tackle as many challenges as they can from a list that includes “sleeping under the stars,” “reaching a summit,” “taking time to clear one’s mind,” “visiting at least one new National Park,” and more.